Choose INSTANTWHIP® B/C TOPPING® for your cakes, pies, desserts – or any other sweet treat. It’s got the rich, creamy taste people remember, yet it’s the up-to-date choice for bakers, cafeterias, caterers, restaurants and dessert manufacturers. 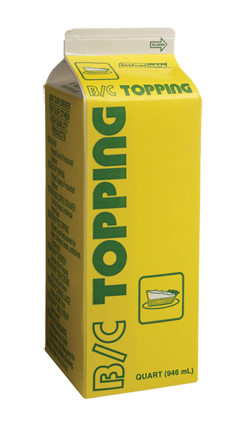 B/C TOPPING® is ready to mix so you can get right to the creativity. Add your own flavors, candies, fruits or coloring; even add it to heavy cream as a stabilizer. Plus, you can freeze it after whipping, so desserts can be safely stored until you’re ready to thaw, serve or sell. Ordering INSTANTWHIP® B/C TOPPING® couldn’t be easier- whether it’s from your local Route Sales Team, online or with a phone call. No defrosting – no mixing – no water to add. Ready to whip. Mixing equipment must be CLEAN and COLD. Shake container well or stir liquid mix thoroughly before pouring into mixer bowl. Nothing to add – has sugar and vanilla in product. Additional sugar, honey, vanilla, coloring, fruits, candies, or flavorings may be added. Do not overload or under load mixing bowl. For best results, the wire whip should be covered from one-fourth to one-half … NOT more or less. Those desiring to use mixture with heavy cream – for best results we recommend 25% heavy cream to 75: B/C or 1 quart heavy cream to 3 quarts B/C. When blending with heavy cream or other ingredients, first start with B/C. When partially whipped add other ingredients. Close carton containing unused liquid mix tightly (this will keep the liquid from thickening and keep out any foreign odors that will affect the flavor). Unused whipped topping must be refrigerated immediately in covered container. Keep liquid product refrigerated between 34º and 38º. Can be frozen after whipped – for birthday cakes, logs, pies, éclairs, and ice cream cakes.